With their lean muscular build, smooth coat, and square stance, the Boxer is truly an impressive looking dog. Being in the working class breed, the Boxer demonstrates an instinctive willingness to please while at the same time showing an alertness, caution and courage in the face of the unknown. They are also a breed that needs to be with their humans as they will follow you from room to room just to be with you. 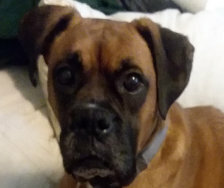 Although the Boxer Rules, they also drool, snore, give wet kisses, pass gas and jump up to greet you. They also consider themselves to be a "lap dog" and WILL try to sit on you to snuggle. 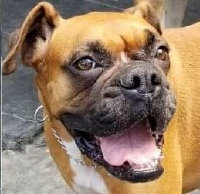 Don’t make the mistake of thinking all boxers are perfect little angels, as there are still those Boxers who just love to get into places and things they don’t belong. If any of the characteristics below are not appealing to you, then the Boxer is NOT the right breed for you. Cleaning Tip: The Magic Eraser does WONDERS for cleaning Boxer Art off your walls!